It happens at various times along the way. Magic that is. 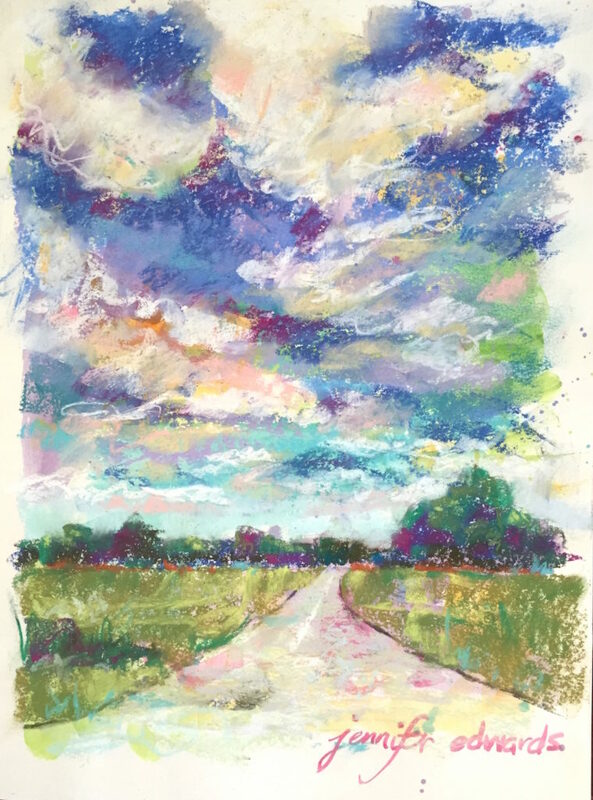 Years ago, when I first swiped watercolor on a white page…I drew in my breath and held it as I watched the color move on the paper, blend with other colors. Something special was happening that was just for me. 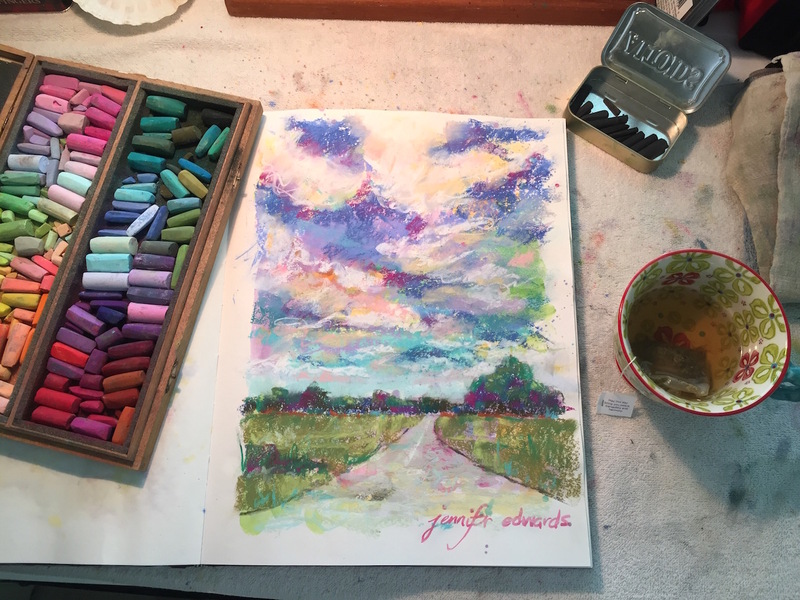 The magic of watercolor has never left me. It’s oozles and wazzles delight me endlessly. 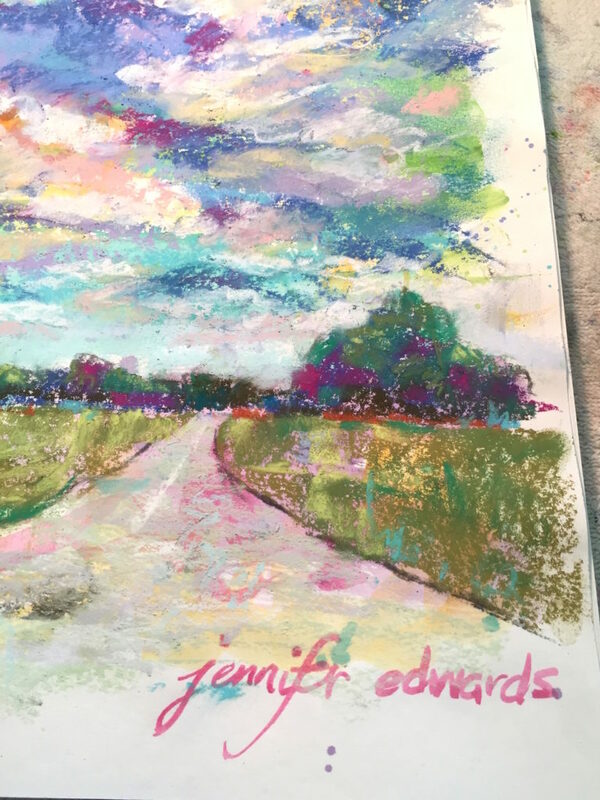 Then one day, again many years ago, I got out a wooden box filled with Rembrandt soft pastels that my grandmother had given me when I was child. Holding a stick on its side, I swooshed the pigment on the page, and there it was again…that feeling that magic was afoot. In neither instance did this magical feeling have to do with WHAT I was creating on the paper. 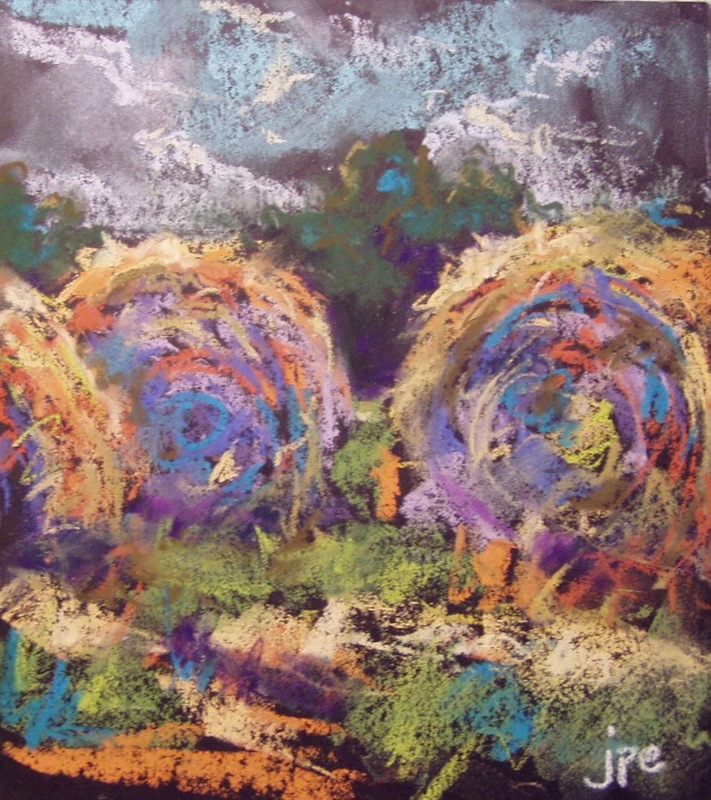 In fact, if you saw these early attempts, you would not be particularly impressed as they looked much like what a kindergarten artist might create. I did not care. The magic was in the process of putting color onto paper. Or was it in the seeing of these colors as they went onto paper? Or was it simply the initial discovery of new mediums? I have now been actively pursuing art-making for almost 20 years. Wow! That seems like a long time to me. You might think that the magic has worn off, the blush of first love at swiping color on a page might have become ho-hum over the years. It does, in some sense, become a normal state of enjoyment for an artist…surely this is what keeps us coming back to make more art! But there are still moments when our breath is taken away; we stand back in awe or delight at the page or canvas before us, and simply are amazed at the loveliness. It isn’t an arrogance or prideful thing. It is merely showing up to the page every day, being present for magic to happen. Some days you feel it. Some days not. And then there are days when the convergence of something new…or at least it feels new…suddenly hits you and you know that magic has happened once again. Its outside of you. It came through you. And it now exists in front of you. This is what happens when I put my favorite creamy pastels over top of random swooshes of watercolor. The first magical moment with this happened soon after our daughter’s wedding this summer. I had pulled out this neglected sketchbook from years ago. I had not made many marks in it for various reasons. Two, maybe three pages had a few half-hearted attempts. So with a what-the-heck attitude, I dashed on some random washes of watercolor, page after page, and let them dry. 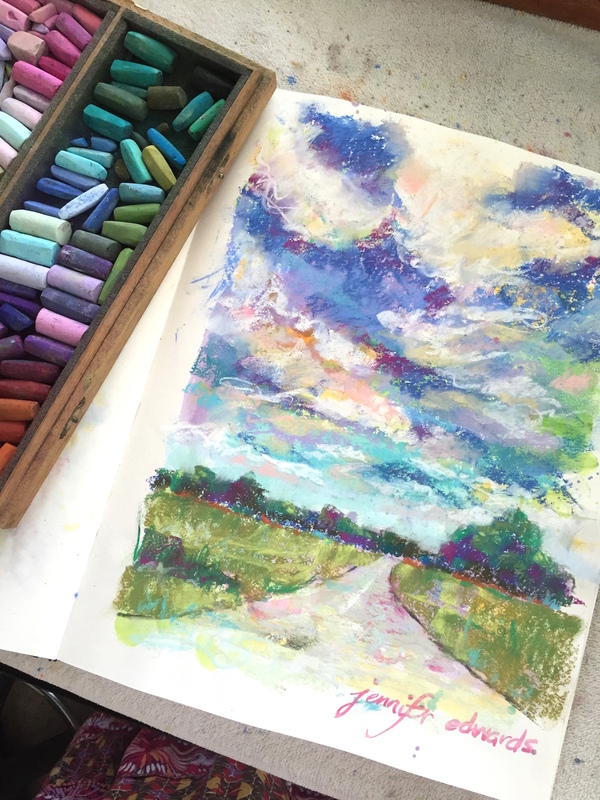 As I was into abstraction over the summer, I swiped pastel over top of one of these pages and knew instantly…I was in love! 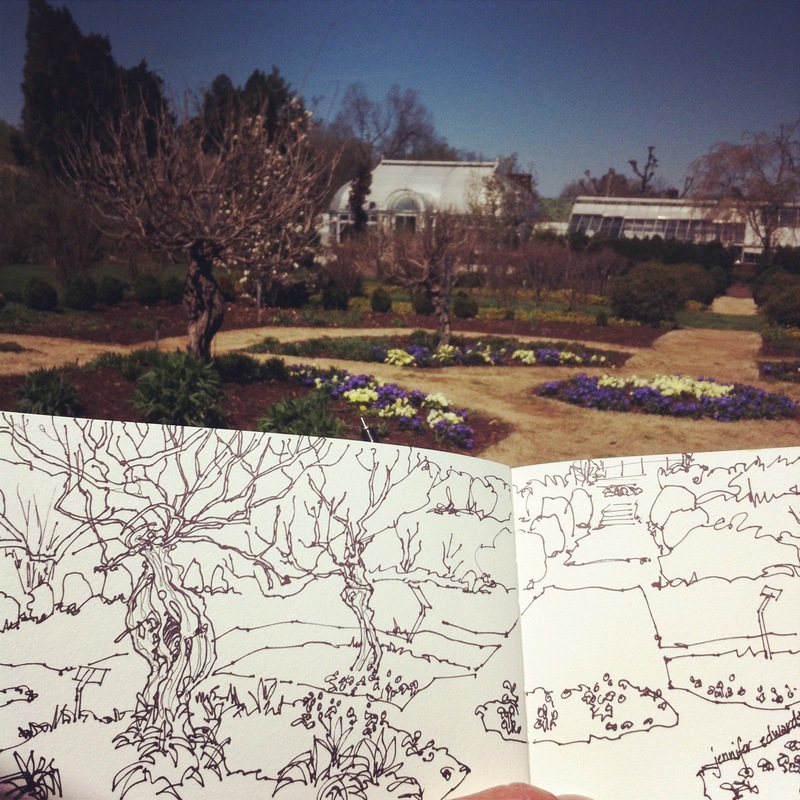 I couldn’t make any more sketches or drawings that day due to its loveliness. 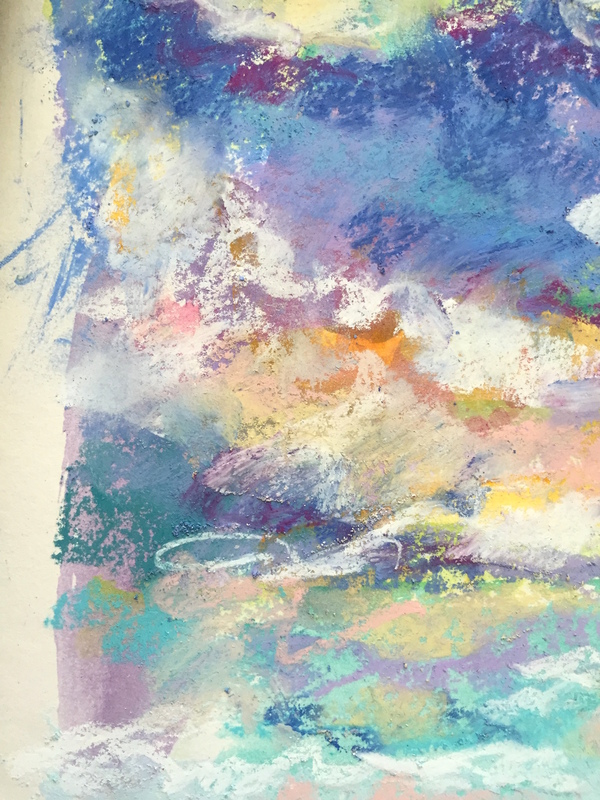 I just walked by my drawing table often to gaze at the soft colors dancing around on top of the watercolor. The next day, I turned the page, and worked again in the same manner. Light touch. Gorgeous color. Again…magic! It was there on the page. I held my breath for only a little while, exhaling gratitude all day. 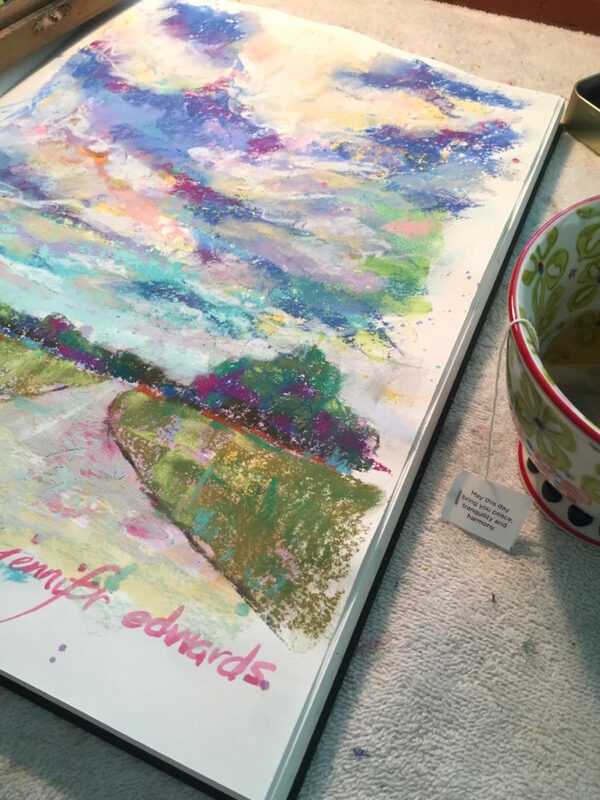 ***Magic may also be due to the tea one drinks while painting! The message on this bag of Green Tea set the tone for this painting. Kinda cool! When it snows, I’m like a bear in winter. No, I do not sleep. In fact I sleep less than usual. But that is because I go into a kind of creative hibernation. So much of what I see just before and during the snowstorm gets translated into something I can touch and feel. 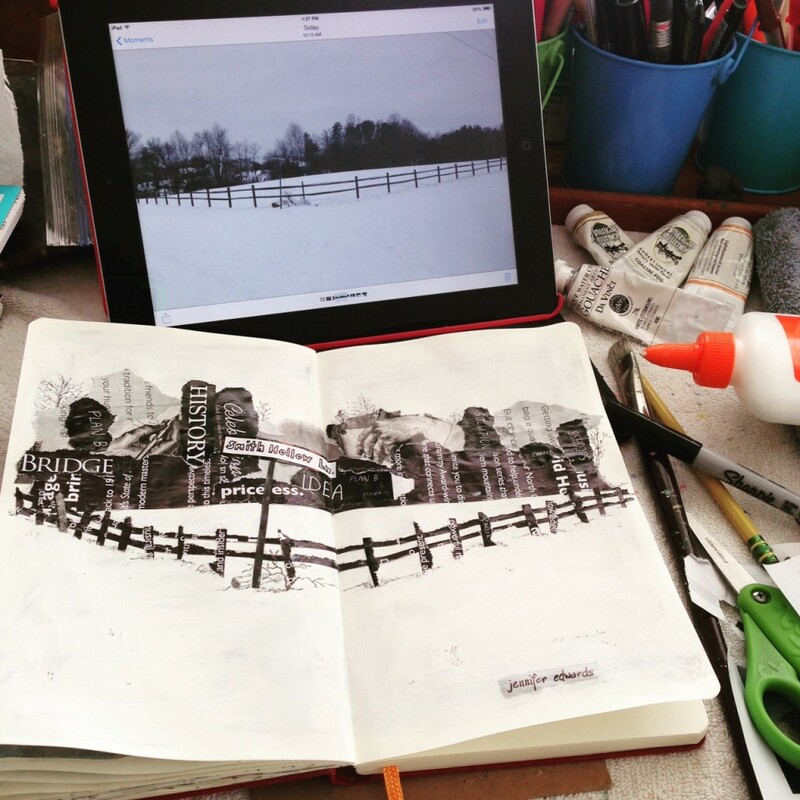 It may seem crazy to go on snowy walks and see collaged papers in the landscape, but there it is. Or to look into my stash of yarns and see a poncho. Much like Eric Carle’s Brown Bear, I’ll tell you if you ask me What I See. But I’ll likely tell you in mediums, colors, and textures. Here goes..
Genevieve, Genevieve, what do you see? I see lines looking at me! I see colors & textures looking at me! I see collaged papers looking at me! I see warm feet looking at me! I see shapes of dark & light looking at me! I see watercolors looking at me! I see a kitty looking at me! Everywhere, everywhere, what do I see? I see beauty looking at me. After last week’s move of three kids into their new “homes”, I’ve needed this week to mend. Oldest daughter is now happily situated at Wingate University for her final year. Middle son is LOVING his first days as a freshman at East Carolina University. And youngest is enjoying her new “big kid” room she moved into across the hall. 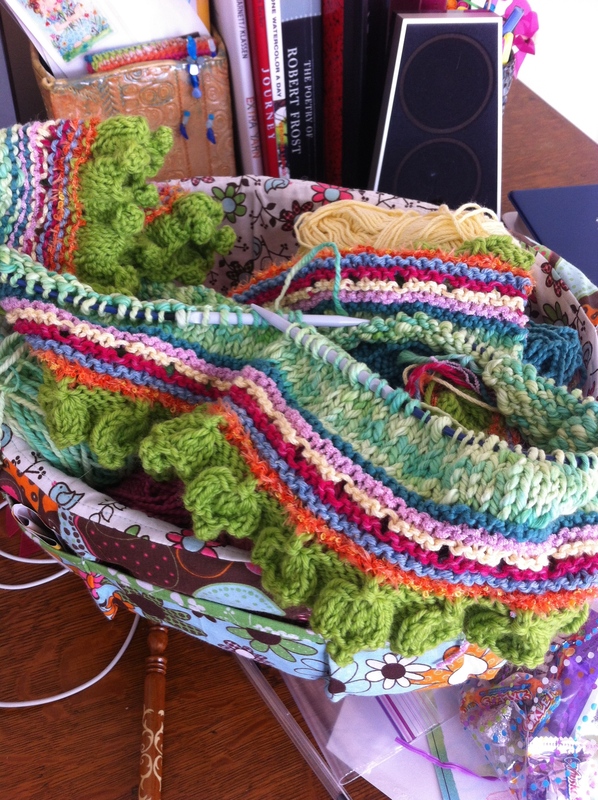 My hands seemed to need soft cozy fibers as much as I could possibly give them this week. 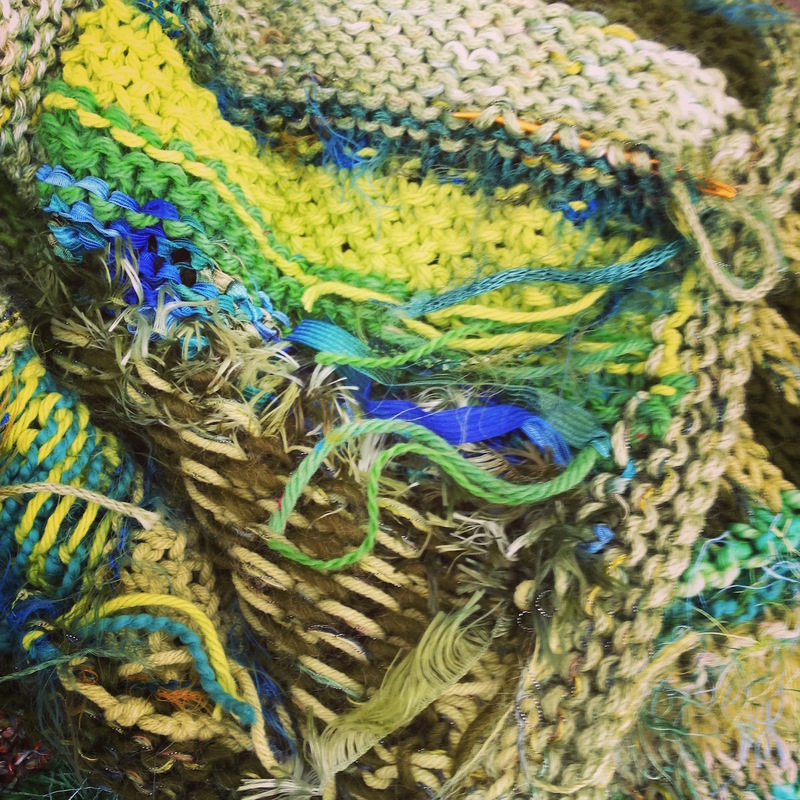 With every knitted stitch and crocheted loop, it felt as if the very fibers of my being were being knitted back together; the unravelled, frayed ends woven in and smoothed out. Even the enormous task of weaving in the ends on a recently finished project (pictured above and below) was soothing and enjoyable. 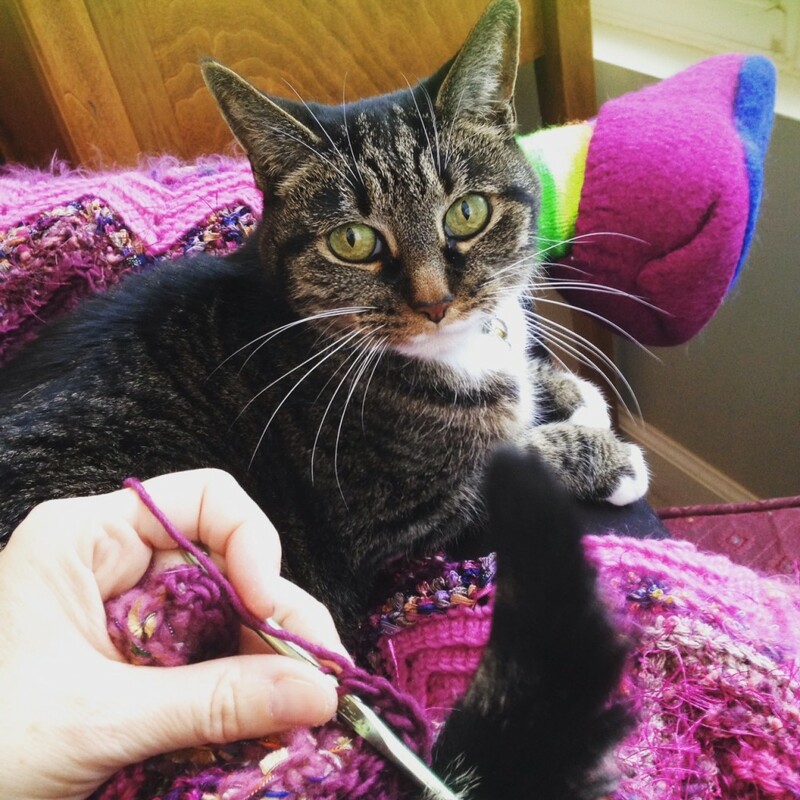 Shakespeare wrote: “Sleep that knits up the ravelled sleave of care…” Although he speaks of “sleep” as the agent of healing here, his choice of words intimate that knitting has that quality of mending what care often frays. All too often my life feels like the first picture. It’s good to know that is only ONE side of the matter. There IS another side…one with beauty, order, structure and functionality. Actually, I see beauty in the underside too, even with all the ends hanging loose! *I finished this updated version of my design/pattern called Dreamy Poncho! Oh how I wish it would get cool enough to wear this thing! So many greens that are truly yummy! 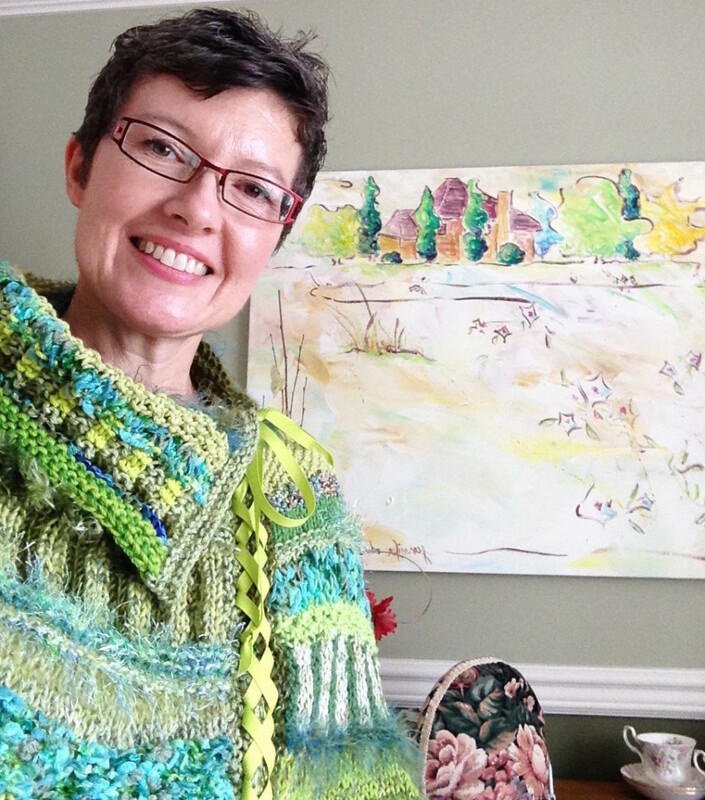 *The painting behind me seems to go with the Poncho so well!! It is of the field at the top of our neighborhood. I painted it a few years ago when the morning glory’s were in bloom. I noticed several days ago on my walk that they are blooming now. 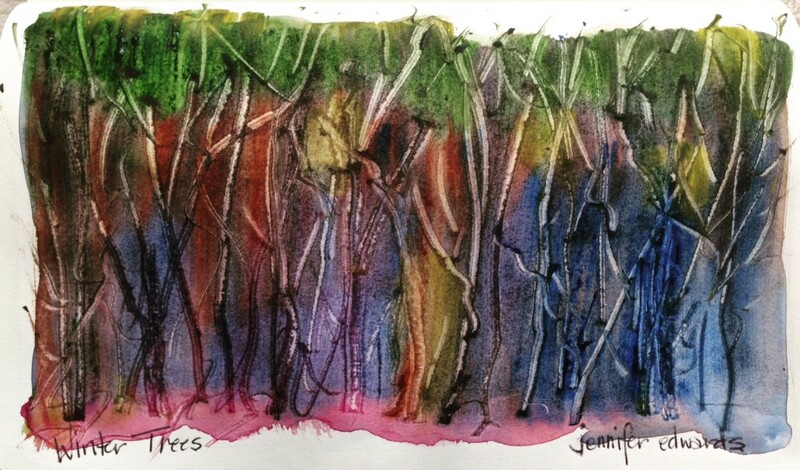 I love the seasons, the change in colors, the varying greens in the landscape as well as in fibers. Where life will lead, my days to fill. I’m going into the field to play. amid the wild flowers I’ll run and laugh. For too much “must-do” is simply too much. So I’m off of Facebook, this blog and such. You can follow me over on Instagram. Life is full! We live it just once. Take a break, pare down, find the essence. See your life beautiful, a bounty to yield. Mr. Whicker had some hay bales dropped off on the wide end of his field up on Silver Dapple Lane. 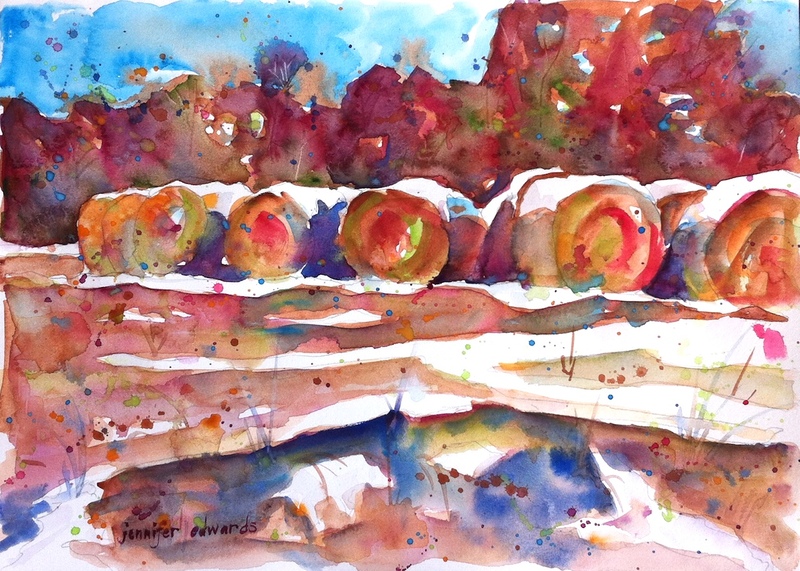 Seeing as how I LOVE hay bales, I just had to draw them with their snow hats on. As I walked in the freshly fallen snow last Wednesday, Mr. Whicker came down the lane in his blue tractor. He stopped to chat for a bit on his way to pick up one of the bales to take to his cows there in the field behind his barns. He said he hoped the cows like it. When I inquired about this, (not realizing that cows can be quite particular about their hay), he said he took some of this hay to cows of his on other land and they didn’t take to it right away. He’s hoping this group of cows will have a liking for it. I guess, cows get used to the same ole same ole, and actually prefer it to something new. Unlike me, a new fresh bale of hay does NOT seem *magical* to cows. As the world outside my windows begins, ever so slowly, to be veiled in white, a sense of anticipation and longing fills the hours. Everyday tasks take on a not-so-everyday glow. A trip to the grocery store becomes an adventure. Laundry becomes lighthearted. Cooking simmers with unprecedented warmth…chili, cornbread, rice krispy treats. I waken early the next day to sigh out my windows–the hushed beauty of white beckoning me to walk in it. And as I walk, a word that pops into my head every time we have snow here in these parts, shows up as bright as the snowy landscape: MAGIC. It is indeed *magic*, for me, every time it snows. I feel like a kid again. The predictable view out my windows is now transformed into something other worldly. Kids are out of school, and I, as a teacher, have a day off. Walking where I have walked so many days and years before seems like a whole new landscape, a different country even, a fresh clean world. Even if the white raiment is a bit see-through in spots, it still evokes magical lands like Narnia and Norway. My own childhood land of Boone, NC is recalled with great sentimentality. My memories only serve to heighten the *magic*. I have, for many years, wondered what it would be like to be able to do my art full time: 8 hours a day, 5 days a week. To paint, draw, knit, crochet, write and illustrate children’s books, design knit & crochet patterns, sell paintings, etc. Wouldn’t it be lovely to have so much time spent doing what I love dearly? Wouldn’t it be, quite literally, *magic*? Folks up north of here are likely NOT thinking *magic* when they look outside their windows. It is quite possible that for many of them, snow is a four letter word. When they look out their windows at yet another fresh snowfall, their Narnia has indeed become a winter that is never Christmas. They see more mounds of snow shoveling, more traffic problems to evade on the way to work, more worries about how to heat their home or whether the roof might fall in. I imagine they grow sick and tired of bundling up every time they just want to step outside their door. Concerns such as these, and many others I’m sure, bring different words to mind when they see snow. Instead of *magic*, it may be *burden*, *weary*, *sick*, or *tired*. I myself, remember winters growing up where we had so many snow days in a row (6 weeks to 3 months worth out of school sometimes) that we actually wanted to go back to school! Still having to do our homework (since they gave it to us over the local radio station), plus all the snow chores (shoveling the driveway, bringing in wood for the wood stove), and having to get along with our siblings, did indeed become a burden, even though memory has a way of pushing all that to the back shelf. Too much of a good thing is…well…too much! 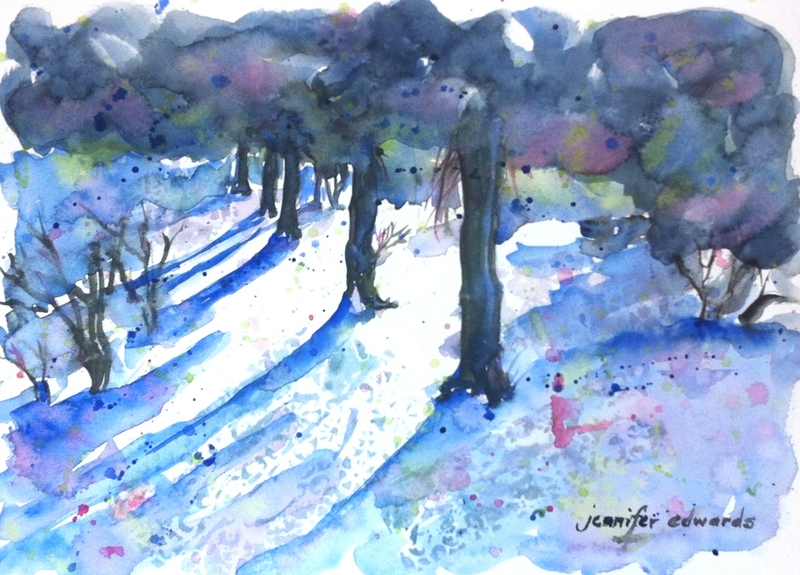 Walking in the *magic* snow this morning, it struck me that perhaps this is why I still feel the *magic* when I paint or draw, knit or crochet. Maybe it is precisely because I am not able to do this full-time that it remains magical in my life. 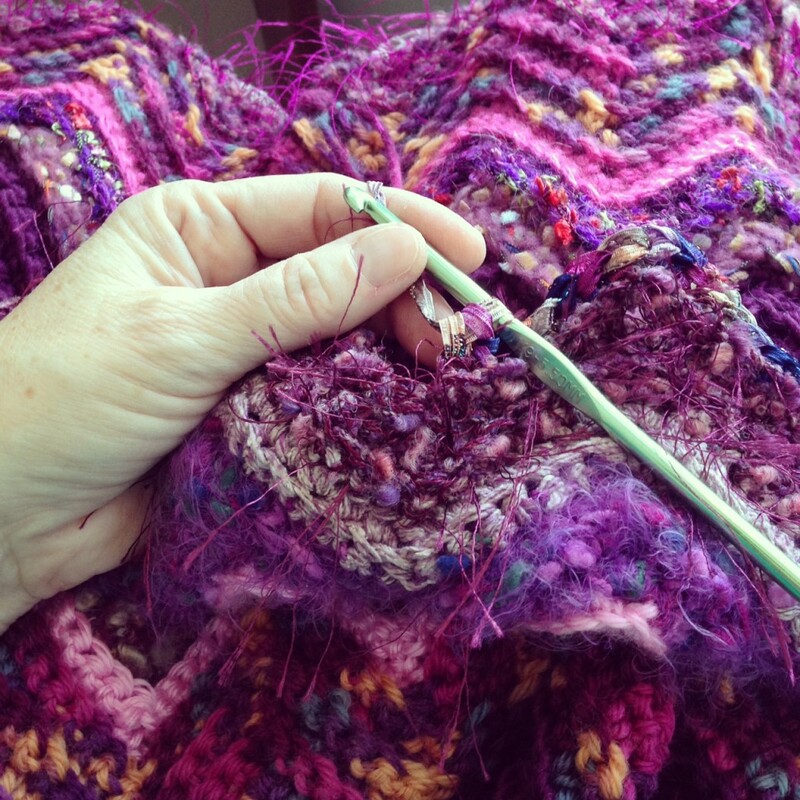 After all these years of making things in and around a full life as wife, mother, and teacher, I still sense that *magic* when I sit down to draw lines or knit a few rows. I wonder, if I did this full-time, if it would lose some of the *magic* just by the sheer volume of it. Perhaps (just perhaps:) it would all become wearying or tiresome if I spent hours and hours every day doing these things. I wonder. Someday, I’d like the opportunity to test it out. But for now, I will revel in the moments here and there that I’m able to create. I’ll even rejoice in the anticipation and longing for time to create. 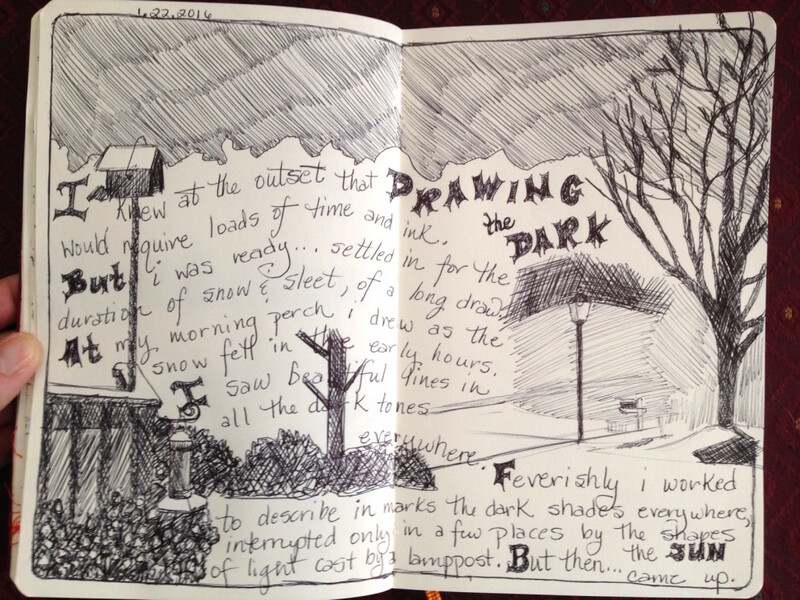 I’ll be grateful for the *magic* of drawing, knitting, and snow. I’ll smile at myself when I complain that I don’t have nearly enough of it! And when it does snow here in Kernersville, North Carolina, I’ll receive that as a day to create all day if I’d like…a whole entire day of *MAGIC*! I long to sit in my field. To listen to the late summer hum. To wonder at the bowed heads of left-behind wheat. To drink in the gorgeous array of color in the wild, dew-dripping grasses. To feel the light breeze and to smell the rain sodden earth. This I love. This feels like home. I would want to paint. To know the exhilaration of putting paint to paper in hopes of coming close to what I see and feel here. To be reminded that my palette of watercolor just cannot do justice to what’s at my feet. To go home from this place knowing I can look back through the pages of my sketchbook and be here again. I would want to knit. 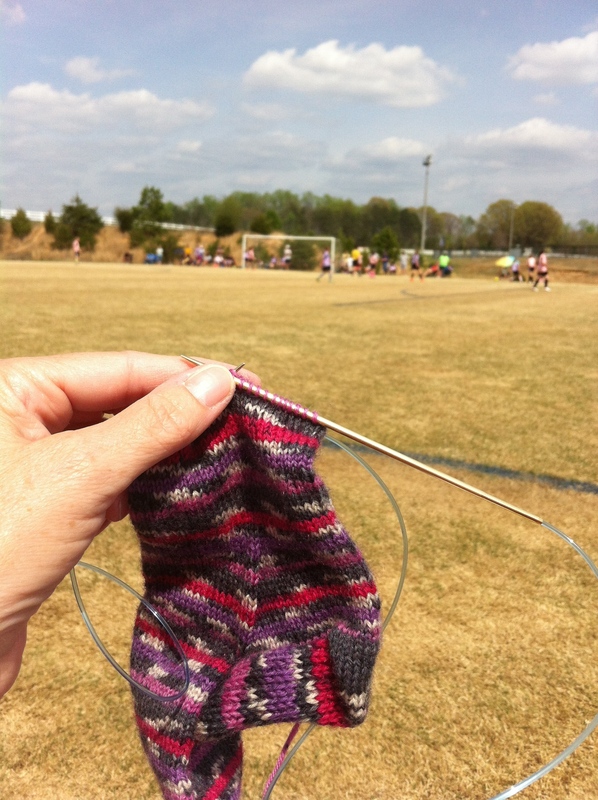 To sit here with wools the colors of the field, running through my fingers and needles. Indeed I would rename the fibers as they fair-isled into a yarn painting: Autumn Grass, Dew Drop, Goldenrod, and Clover Hay. And each time I wore the finished piece I’d be able to smell the earth and hear the sounds of my field. I would want to write. To craft words that represent each blade of grass, wheat, and wild flower. Letters that give real-time meaning to the other-worldly air I breathe here. 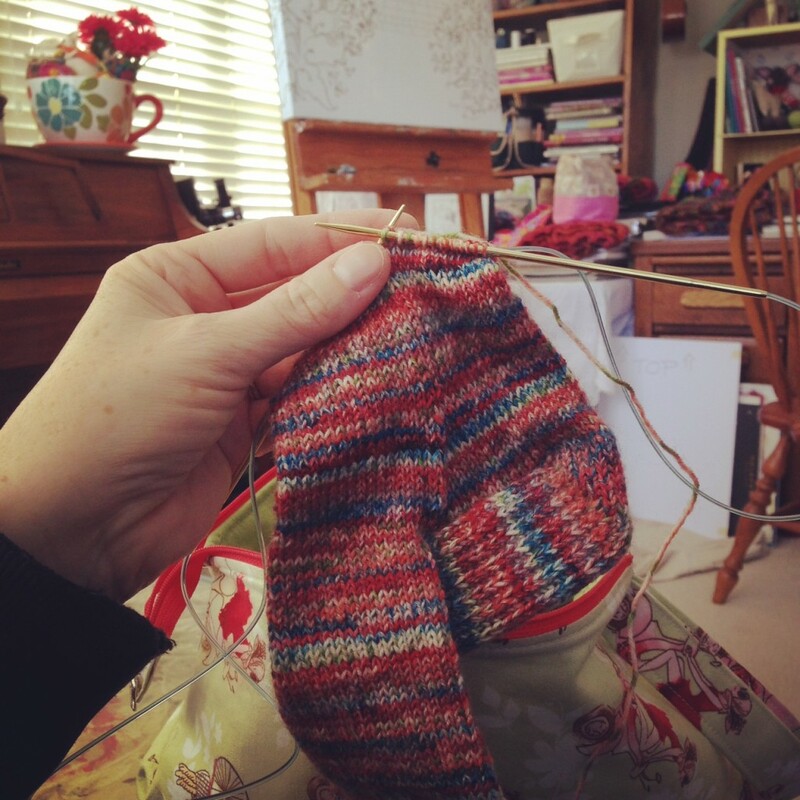 Words that would be carefully crafted as if I had knit them…or painted them. But I’ve come to my field without any of these. Just to sit and take it all in. I breathe in and out. I gaze and marvel. I ruminate. I try to cease all thought. And then I close my eyes. Something trickles down my cheeks. 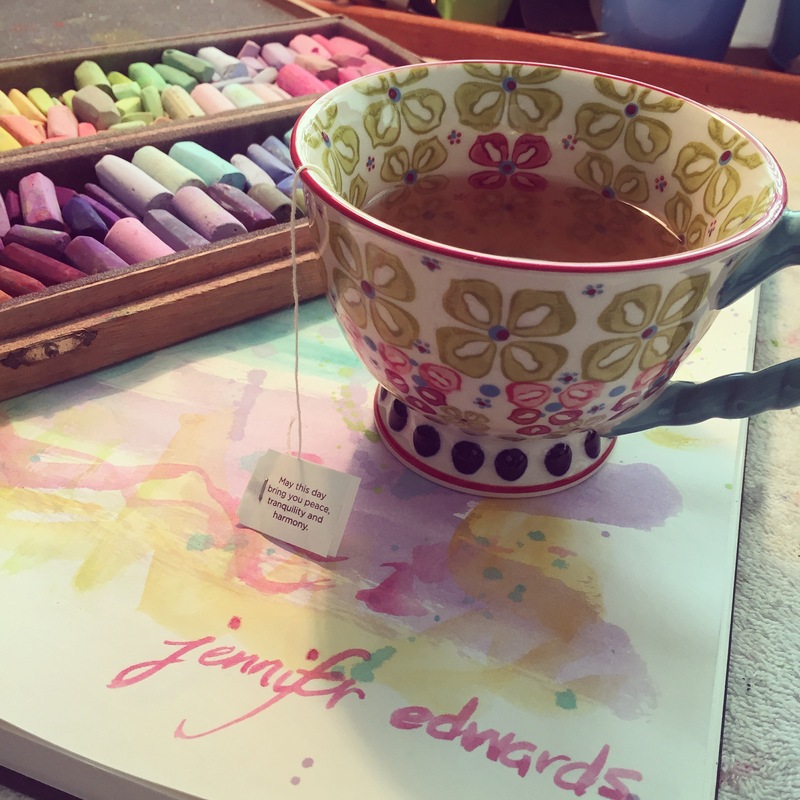 It is then that I have a thought I’ve never had before—perhaps all the paintings in watercolor and yarn, all the sketches and drawings, the knitted and crocheted creations, are tear-shaped drops that reflect the beauty that’s all around me. Perhaps a need to create is a way of exhaling it out, a way of crying to the Universe that it is so beautiful and I must make something of it or else I’d simply weep everywhere I go. Next time, I’ll bring my paints or some yarn or my writing book. In so doing, I’ll continue the trail of happy tears as I bask in the glory of my field. But each day I would try to walk a bit further. Hunched over and shuffling, I just didn’t care how feeble I looked. I took my husband or a friend with me, and breathed in the fresh air, drank in the lingering spring, enjoying moving my legs. The last two days, I have ventured up to Silver Dapple Lane. My favorite lane in the whole world. My neighbor and I have gone down and back twice. And today, I even made it three times! Progress indeed! The lane is lined with wildflowers, especially over in Mr. Whicker’s field. At the end of the lane is the best view ever! One of Mr. Whicker’s pastures for his cows is burgeoning with buttercups! It looks positively dreamy! 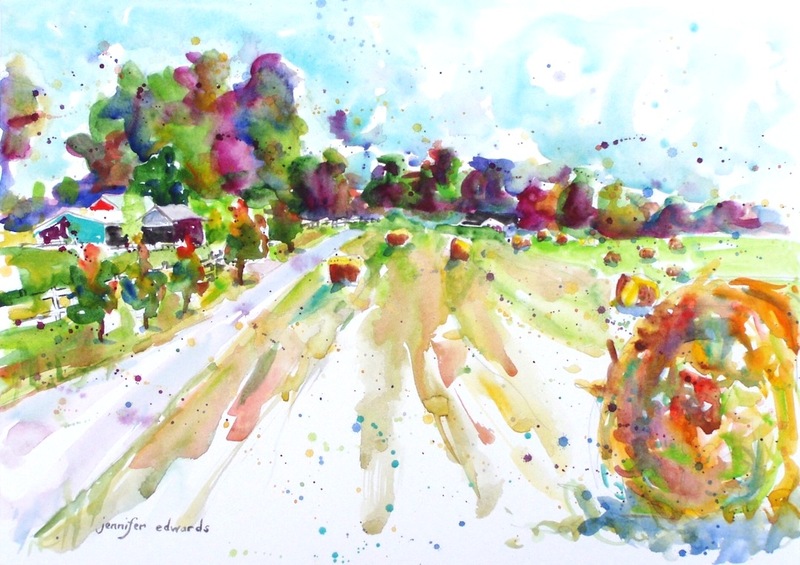 So I came home today and tried to capture that dreamy field on paper with watercolor. I don’t know that I got it exactly…but it’s enough to remind me of this morning…a gift to start my day. 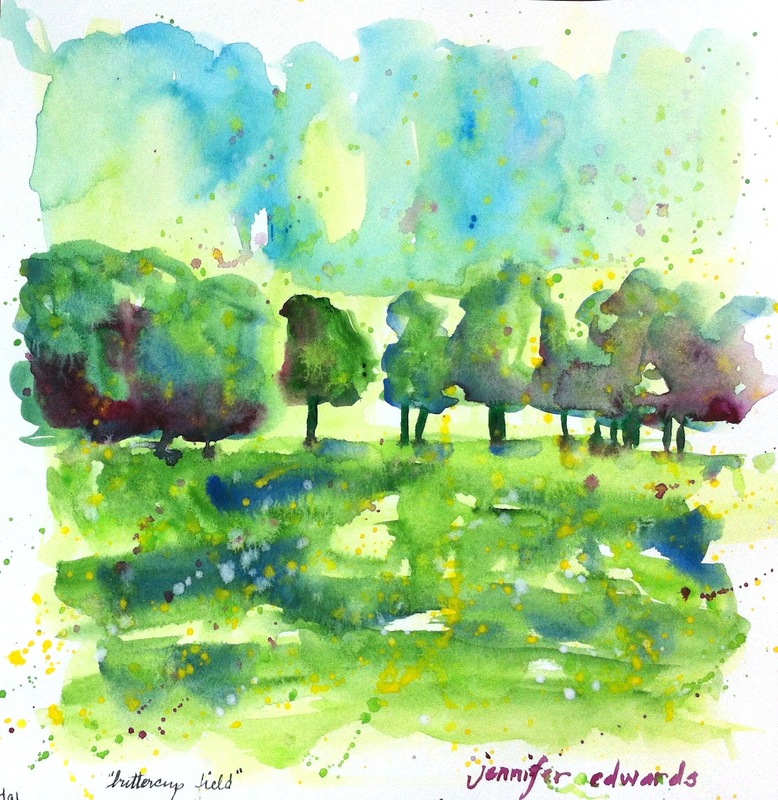 Favorite Thing #1: Nothing gets better than sitting IN MY FIELD painting. 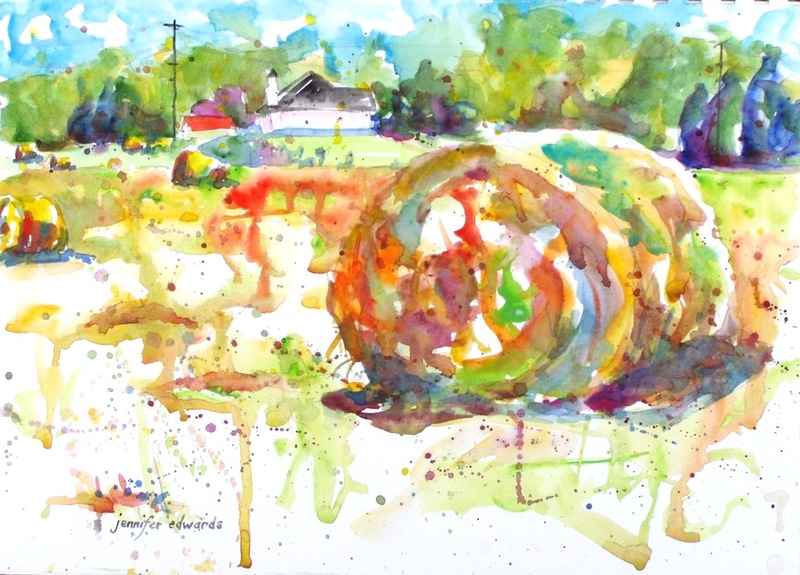 A few of weeks ago I got to spend an afternoon painting a couple of views of the freshly baled hay in Mr. Whicker’s field. I keep calling it “my” field, and it really isn’t. 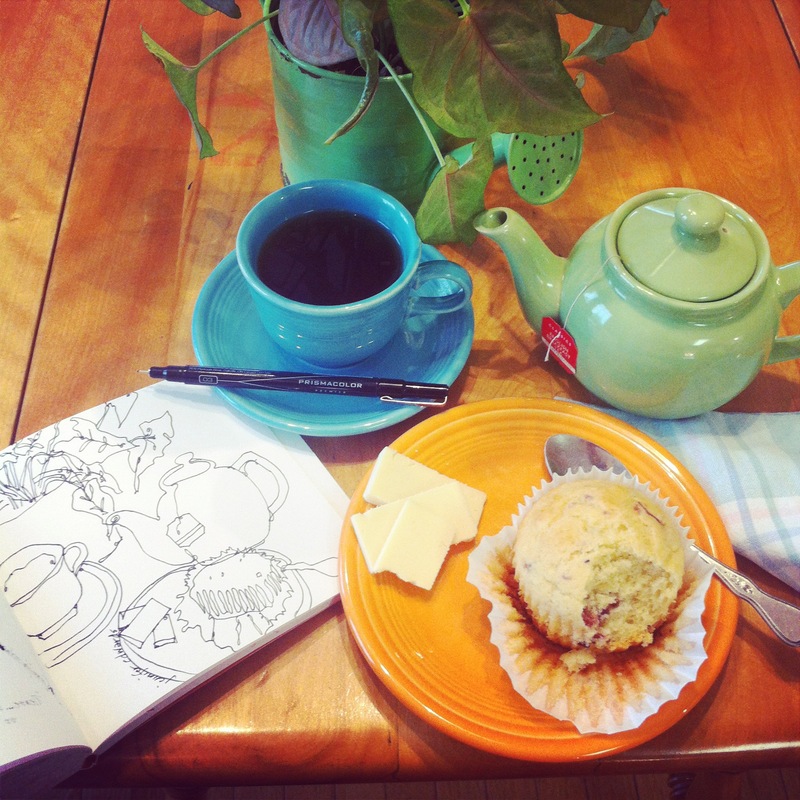 But I call it that because it is a favorite place to be, to walk by, to listen in, and to paint and draw. Favorite Thing #2: Getting to be there long enough for TWO paintings. And then the very next day, the tractors came through gathering them for the barn. I was so glad I had gotten out there and captured their loveliness while I could. 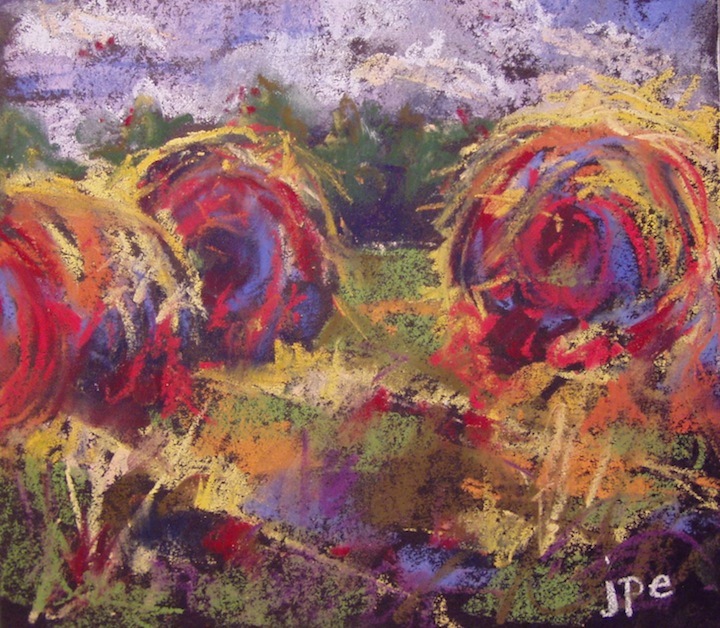 Hay bales, for some odd reason, are so beautiful to me! 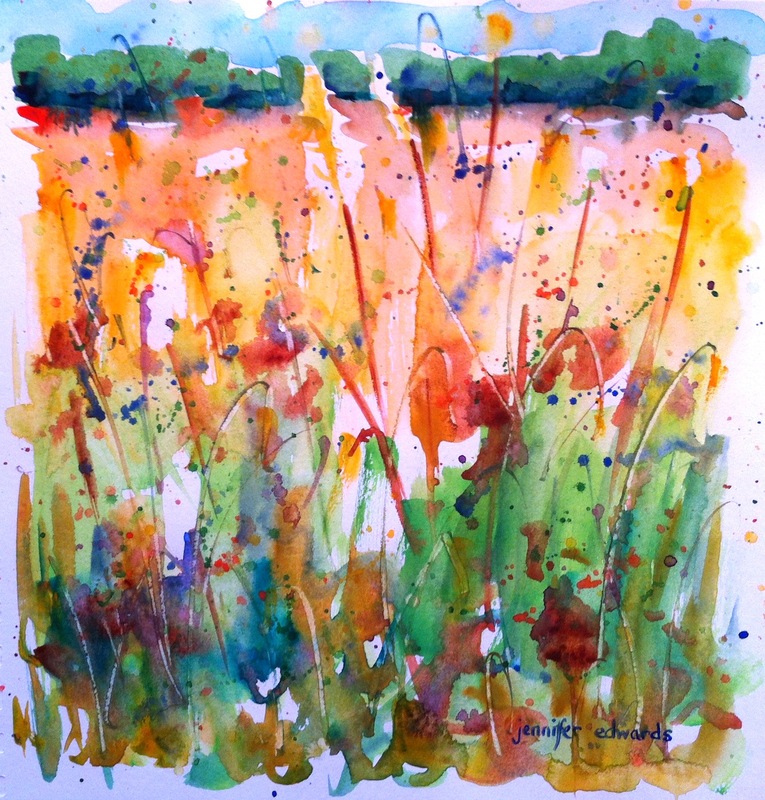 I like to think of them as all the colors of the field wrapped up in a bundle. Favorite Thing #3: Offering these little spots of beauty from my life to yours. 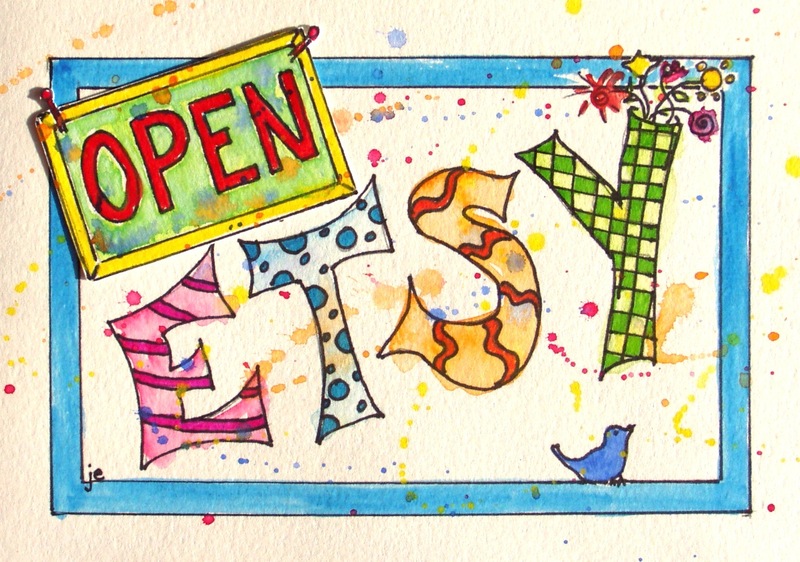 Please check out my Etsy Shop called Drawn2Shoppe. There are a few other original works for sale there. 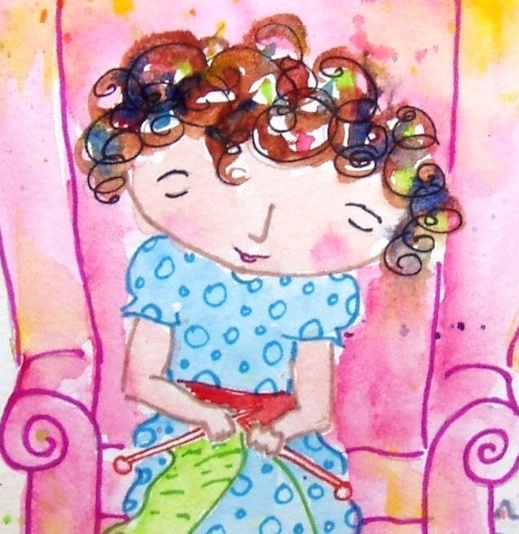 More will be added to the original paintings and drawings, as well as more knit and crochet patterns. There’s a special spot for commissioned portrait vignettes, which I’m very excited to offer! Maybe these are a few of YOUR favorite things too!